This Brusho background sort of rose up in the middle while it was still wet and resulted in those sweeps of blue that reminded me of a wave. So I fussy cut some mermaids from a sheet of Myths & Magic Designer Series Paper. This Brusho background reminded me of a wave - so I added mermaids! The base card is Night of Navy and then I picked up the pink in the background with a layer of Powder Pink cardstock and the Brusho layer is sitting on another piece of the Myths & Magic paper. 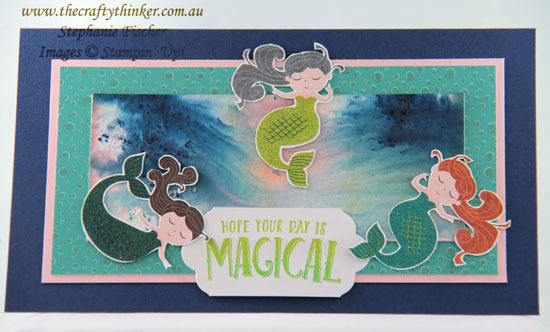 I trimmed down the Lots of Labels die cut to better fit the card shape and tapped the sentiment stamp onto a Lemon Lime Twist ink pad before using a sponge dauber to add some Bermuda Bay ink to the bottom of the stamp.